In a lined pond pond at Eldoret, Rift Valley, Kenya. December 2015. Length of this specimen is about 8 cm. 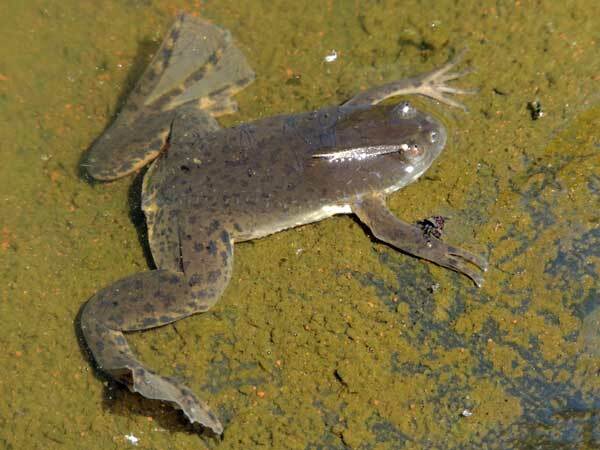 The hind feet are webbed as part of this frog's adaptations as an entirely aquatic animal. The eyes are positioned on the top of the head to keep alert to overhead predators. Three claws are present on each of the hind feet. X. victorianus is apparently not clearly differentiated from X. laevis.